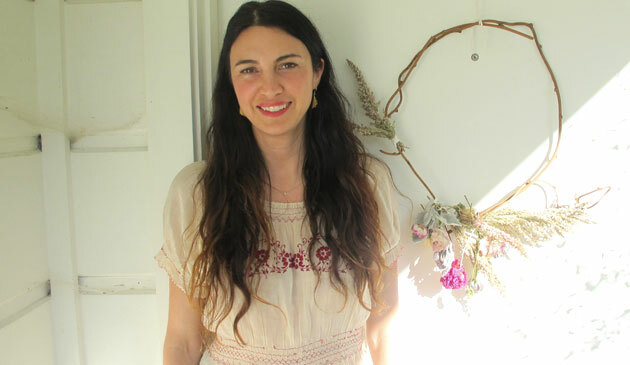 Back in March I spent the afternoon with Shiva Rose in her spectacular Venice Beach home. Shiva has a really fun, informative, and aesthetically beautiful blog called The Local Rose, where she writes about living her best green life, and others living theirs. I love Shiva’s vibe. In her backyard there were the most vibrantly colored chickens (or were they hens or roosters? Why don’t I know the difference?) running around, and her house was that perfect blend of styles: relaxed bohemian, mid-century modern, rustic, and multi-cultured. (I immediately started daydreaming about moving in and throwing parties to show it off). Shiva’s beautiful and talented daughter shot a little video of us as I gave Shiva a face oil massage with a delicious oil from La Bella Figura, taught her how to use her eyelash curler to its fullest potential, an then gave her a little makeover using products from an all –green makeup line called W3LL People. Thanks again, Shiva. When can we film episode two (or at least just hang out again?) I’m back in LA!